Minutes of meeting (MOM) are instrumental to formally record discussions and decisions made about a list of items. MEETING MINUTES. Locations, attendees, communication protocols, forms to be used... the effectiveness of our minutes depend on the business we are talking about, the significance of the meeting in subject and the way we write down such documents. They are not just a summary, they can be a powerful tool to track actions and consistently follow up. The intent of the post is to provide beginners with a few general guidelines to correctly wrap up a business meeting, according to a template that you will find at the bottom of the page. The main purpose in collecting input and output of a meeting, particularly if it is supposed to continue after a first session, is basically to share a document listing all the agreed items, (or otherwise the different points of view) and the subsequent actions, if any. There are no hard rules but in principle, a set of minutes should be drafted real time during the discussion, printed upon completion of the meeting, and circulated immediately after to the attendees and the agreed distribution list. It may need to be signed in final version after review and correction of mistakes or omissions if the document is expected to be integral part of a contract. A scan copy of the signed document should be issued in un-modifiable electronic format like a PDF. Cover sheet: this is the section where the main references are to be shown. It needs to facilitate the storage of the document and its retrieval at a later stage. Therefore, all the necessary information are to be included in order to allow a correct indexing and categorization. Company/organization name and logo: whether it is on the top or somewhere in background, the cover sheet needs to bring out the organization owner of the document. 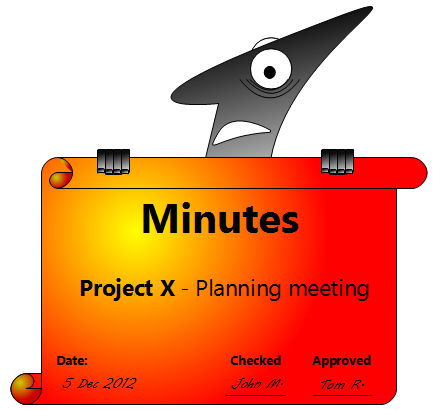 Title: it needs to recall the project name and the event/milestone for which people are meeting. As example: Project X - Financial reconciliation meeting @ Q3 2017. Date: simply put the dates of the meeting. A time windows is ok too, if the meeting is longer than 1 day. Protocol/Reference: depending on the communication plan, the organization may want to include an identification number (ID#) of the MOM. If this is the case, there must be a pre-existing register somewhere in the project repository to calculate the right ID to be used, based on the predecessors already booked for other documents. It is definitely worth to include in the form such field, even in absence of said index; a new ID can be created at spot basis. 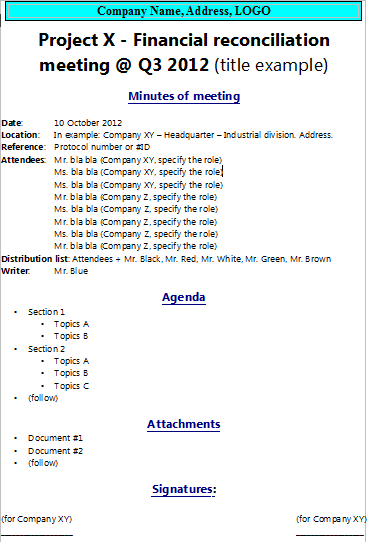 Agenda: the meeting is, most of the times, preceded by an invitation including an agenda. It is therefore expected that the meeting will be led to cover the points highlighted therein and it is expected, in consequence, that the MOM will include that agenda in the coversheet. Signatures: this is a fundamental field, being the area where the representatives of the parties attending the meeting have to ratify the agreement, or the correct summary of the respective positions about the items discussed. Attendees/recipients lists: here we have to list all the participants and even who is absent despite the invitation, any unexpected individual shown up. A best practice is to include, and distinguish in a separate list, also the people to whom the MOM has to be circulated (recipients). This additional list is generally broader than the list of the people attending the session. Due to the fact that the attendees/recipient lists can be quite extended, it is suggested to put them in the second page rather than "compressing" everything in the cover sheet, this just for a better reading of the MOM. 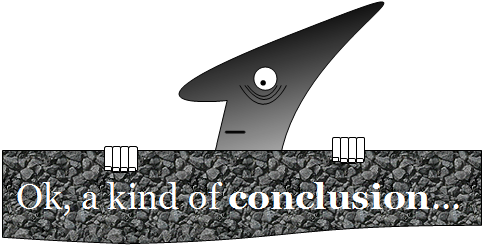 Body: this is the section where the content of the discussion has to be summarized. The summary can be outlined as a table describing each topic in a row. Unless the attendees have to handle a single item, it is worth to identify each section and the relevant topics with a numerical and progressive #ID, unequivocally indicated in the first column left side (i.e 1.1, 1.2, 1.3 and then 2.1, 2.2, 2.3 and so on). A column to filter the topics based on their status (open/closed) is extremely useful as long as you will keep working on the native electronic form. As opposed to a table, the body can be also compiled as a sequential collection of the talking points. My recommendation is to select the most suitable form based on the circumstances: a MOM which is going to be a legal document, to be integrated into a contract, has to include IDs for each point and mention the parties supporting those items. It is likely that in the future the paragraphs of that MOM shall be extensively referenced somewhere else and it is worth to avoid the burdensome exercise of copy/paste the content not numerically identified. Either way, since a MOM is prepared with the aim to make the notes clear for everyone (including people not attending the meeting) the topics have to be recorded in such a way that the body is not overloaded with useless information. Agreements and decisions are to be wrote down with a concise wording, whilst it is highly recommended to avoid a verbatim summary. It has to be remarked that in case some actions are identified as necessary to address specific topics, a MOM needs to track them. As shown above in the picture, specific columns are to be added to describe such actions. They have to be filled in with the names of the individuals in charge for them and their deadlines to close them. Should you have to record a conflicting discussion, just track reciprocal positions . The acronym "TBD" (to be defined) can be indicated in the column where a date should be (parties shall always consider the possibility to agree on the earliest deadline to define the missing closure date). The list of all the action items may be then resumed at the bottom of MOM, before listing the attachments or as a separate attachment. Attachments: This last section is foreseen to mention/include files and additional documents which are integral part of the MOM. Practice and present this kind of structured template, reorganized as you wish based on your needs, and be sure that even the worst detractor of project management methodologies will highly appreciate the effort you spent.